Mr Ganzorig Vanchig is a chairman at Bat Solution Partners and responsible for strategic planning, business development, project management, and investment activities. Prior to joining Bat Solution Partners, he was a CEO of Media Group, and Senior Vice President of Shunkhlai Group. Ganzorig completed his Master’s degree majoring in Electronic Business Management from International University of Japan and before leaving for Japan he used to work as Deputy CEO of MOSDAQ LLC which was one of short listed company jointly with NASDAQ OMX Group by the Mongolian Government with the aim to establish the first ever private securities exchange in Ulaanbaatar. 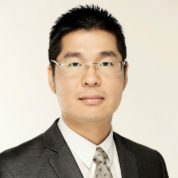 He also holds BBA in Accountancy from the Institute of Commerce and Business Mongolia and MBA degree from the University of Notre Dame Australia. Before leaving for Australia, he worked as a lecturer at the Institute of Commerce and Business in Mongolia. After obtaining his MBA degree, he started working in the Mongolian banking sector (Trade and Development Bank and XacBank) in fields of retail banking, marketing, research, product development, project management, public and international relations. He is a founder and chairman of Down Syndrome Association of Mongolia and a board member of Special Olympics Committee Mongolia. Ganzorig is an active member of CFO Club Mongolia and E- Station Community that unites Mongolians who live, study, and work abroad. He was chosen as Young Global Leader by the World Economic Forum in 2014. "There is a Mongolian proverb that is saying “The quality of a teacher’s skill is seen from the pupil’s attitude.” Therefore, the teachers are the fundamental of our society’s future. I strongly believe that global connectivity and sustainable development depend on the a firm investment in today’s children through their education."